The DC-LAMP antigen (70-90 kDa) is a new member of the LAMP (lysosome-associated membrane protein) family. As other LAMP members such as CD68, DC-LAMP is a type I integral membrane protein of 416 amino acid residues, highly glycosylated (7 N- and some O- glycosylation sites), with 90% of the molecule located in the lumen of lysosomes. DC-LAMP is specifically expressed by those mature dendritic cells (DC) located in T cell areas of lymphoid tissues, which are known as interdigitating dendritic cells (IDC). 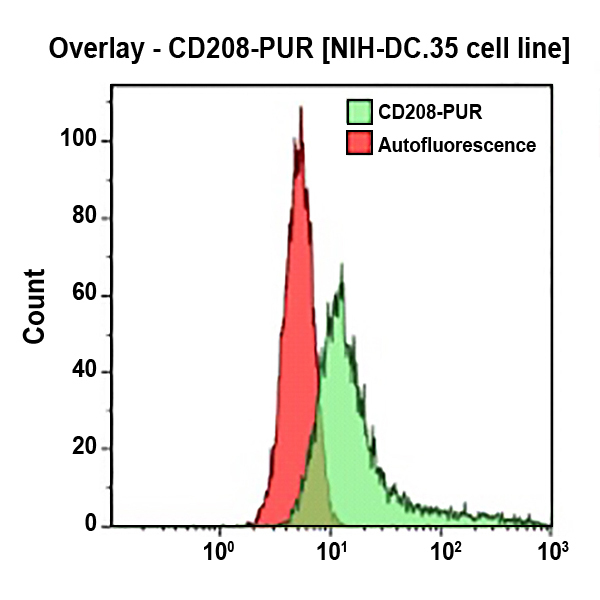 A direct correlation between the expression of DC-LAMP and that of other maturation markers such as CD86 has been established. DC-LAMP first appears in the MHC Class II compartment, suggesting an important contribution of DC-LAMP to the processing of exogenous antigens. Clone Description In flow cytometry, the 104.G4 antibody shows intracytoplasmic staining of DCs derived either from CD34+ cell cultures activated with TNFα and CD40L, or from monocyte cultures activated with TNFα, LPS and CD40L.